The central nervous system (including brain) and heart, the most aerobic organs, are most sensitive to CO. In the heart, CO can cause chest pain, known as angina, and/or precipitate heart attack (myocardial infarction). 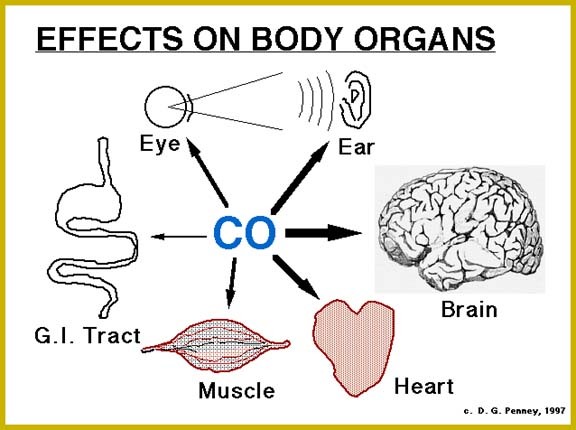 The immediate and residual (longterm) effects of CO on the brain are multitudinous. Vision and audition may be effected both short and longterm. The effects on muscle, gastrointestinal tract, skin, skeleton, etc. are less pronounced/likely.